Duck Duck Moose did it again! Their apps continue to make our list of favorites. Today we played Word Wagon for the first time. This app is going to be so helpful for learning letters and recognizing words. It includes 4 levels to grow with your child: Letters, Phonics, Spelling I, and Spelling II. (In the video we did phonics.) Each word you spell gets added to your wagon and posted on your sticker board. After 3 words matched in a row, you get to play a star matching game to create the outline of a mystery animal. Super fun! Update: She *knows* her ABCs. See Epilogue. The *signing* is not exactly pitch perfect, but the *signing* is pretty good! The sign for “star” is made by rubbing the sides of your index fingers together. The “Like a diamond in the sky” part (loosely translated by Stella as “Like a da-do-da-da-da”) is signed by using your right hand to make the letter “d” and tapping it on your left ring finger as you raise it toward the sky. When she is in the stroller, you can see her attempt this sign—she even gets the right finger! Stella learned how to sign this song from the SignShine app. I’ve had a lot of traffic lately from other moms looking for app reviews, which is really fun for me! I love getting in touch with other parents this way! The excitement made me consider devoting more of my posts exclusively to app reviews. However, I realized that there are already other sites that do a really great job of this; plus, it would derail me from my original purpose, which focuses specifically on one child’s digital journey between 12-24 months. Stella loves to sing; her favorite song is “Twinkle Little Star.” I figured out how to play the song, so I decided to see if I could teach her the notes—or at least see how long she would retain interest during the lesson. It was fun! I think she understands that each of those keys produces a different sound, so with a little repetition, I think she’ll become more aware that there is an order in which to play [touch] them. It’s fun to see what she thought of this app just 7 months ago. We reviewed this app a month ago. At that time, I noted that she couldn’t do a lot of the games in this app (or maybe just didn’t have any interest). Either way, she is becoming a lot more independent with many of the app’s tasks now. She rarely needs my help when putting the right shapes into the right silhouettes. This app has been a perfect partner for her as she refines her visual-spatial awareness. One of the best parts of my day is picking up Stella from daycare. Although she loves it there and rarely wants to leave, when I finally get her in the car, she is a happy talker. I usually give her a pretend phone after I buckler her up, and she talks on it all the way home. Her conversations start out by greeting grandma (Ohhhhhhigamma!”), and they almost always include the names “Holly” and “Ko-be” (Colby). Yesterday I decided to record her “conversation” so that I could remember this imaginative endeavor forever. Note her pauses for when she’s “listening” to the other person on the line. Outside of talking on the phone, Stella is very good at putting together words and speaking in small sentences—which most often come out like commands (“High five, daddy,” “No hair,” “More cheerios,” “I try it,”—but this lingering Babble Phase reminds me that she is still acquiring and refining so many language skills beyond vocabulary. She is relying on linguistic statistics that she picked up in early infancy or even inside of the womb. Who knew language development was such a nauseating and miraculous process? Apple claims that right now, 1.5 million iPads are in use in educational programs today with over 20,000 apps. In fact, the idea of eBooks aren’t new either—some educators have integrated eBooks into general curriculum, as this student satirically demonstrates by lamenting over his printed textbook from a video in 2009. If that part was the yummy cake, here is the incredibly delicious icing: Teachers can create their own books using a new OS X program called iBooks Author. Aside from requiring a mac to use it, the program itself is completely free! Educators can re-format and digitize their existing materials for any genre with easy-to-use templates. 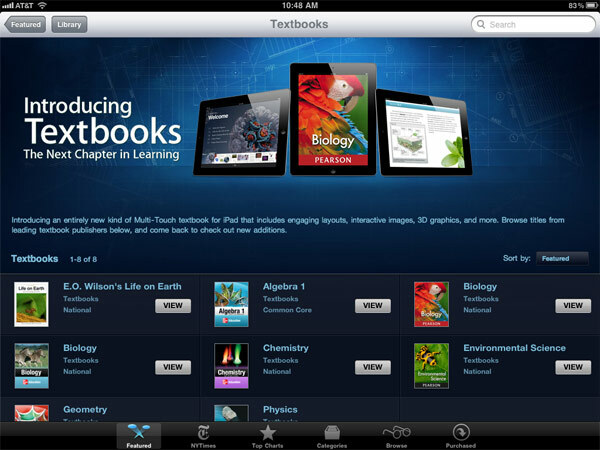 The announcement of iBooks 2 also has implications for the future of iTunes U. Although technology can’t solve the education problem, as Steve Jobs famously noted, this announcement implies a shake-up to the educational experience and puts more power back into the learner’s hands. As a mom of a young child, this news will generate a lot of excitement in our household for years to come! Kai-haf-it = Can I have it? *She still requests this show exclusively, despite our attempts to watch other ones. During the intro song, she’ll now sing the parts for Foofa and Tutie (aka “she’s pink and happy” and “she likes to have fun”). When the intro song is over, she yells, “WYKAAAAAA!” Every. Single. Time. According to YouTube, an 18 month old counting to 10 is not that unusual. This study, reported by Fiona Macrae at Mail Online, explains that children recognize the routine of scoring off individual objects one-by-one before their second birthday—even if they don’t say it aloud. Jesse and I learned yet another thing from this experience: Treating Stella like a show pony for even a few hours between the three of us was a bad idea. By the end of the night, she would simply shout a number—any number— clap her hands, say, “Yay,” and expect us to join in the praise. We created a Count Dracula Monster. Raaawwr! Packing sandwiches for the zoo, Jesse asked me how many to make (including grandparents). I said, “Well, Stella will eat one…” Just as I trailed off in thought, Stella chimed in from the background and said, “Two…” as if we were practicing counting. I was stunned. Little did I know, however, that was nothing! Today we were “reading” the 10 Little Ladybug book. We were on the “3” page, and just after I pointed and said, “3,” Stella continued counting from 4 to 9 all by herself. No lie! I have no doubt that the Oscar’s Balloons app contributed to her catching on to memorization so quickly. After throwing a fit over eating, I picked her up in my arms to calm her. When she was done crying, she patted my back a few times and said, “I sorry. I sorry.” She could’ve learned this from a number of places, including daycare, me, or Yo Gabba Gabba, which is also on her iPad. 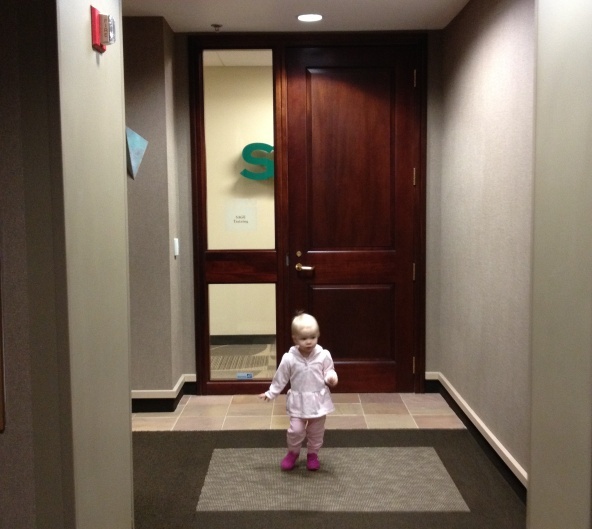 I took Stella to work with me this morning (Saturday) to pick up something. Walking down a long hallway to get to my office, she pointed ahead and said, “S!” As far as I knew, the only letters she knew were “A” and “O.” The “S” was a very pleasant surprise!